Dubai: Visitors attending a wedding reception in Fujairah had their celebration cut short after unruly drivers prompted police to intervene. 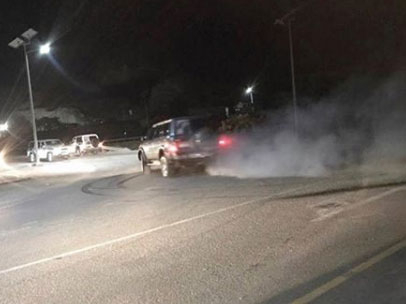 The department of traffic and patrols at Fujairah Police received a report earlier this week about seven young men who performed doughnuts and drove recklessly at a dangerously close distance to a wedding tent. Police immediately rushed to the quiet neighbourhood of Wadi Al Sidr and arrested the drivers. Brigadier Ali Rashid Bin Awash Al Yamani, Director of Traffic and Patrols Department, said that the offenders were between the ages of 20 and 25. According to Arabic media reports, the offenders’ vehicles will also be impounded for four months and the drivers will be obliged to attend road safety lectures to ensure that a similar incident does not reoccur. If caught driving recklessly in the UAE, motorists will be slapped with a Dh2,000 fine and 23 black points, in addition to having their vehicles confiscated.